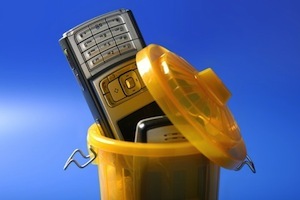 There is to be a workshop on the issue of electronic waste at the African Utility Week, which takes place in May. While few would argue that the technological explosion, witnessed over the course of the last 30 years, has not brought about many advantages, bringing about instant connectivity to anywhere in the world and many advances in the fields of mobile telephony, broadcasting equipment and computer hardware. The flipside to this progress however is the fact that there is estimated to be 50 million tons of electronic waste generated worldwide each year, with the world becoming increasingly burdened by the amount of discarded technology such as old cell phones, television sets, washing machines, refrigerators, dishwashers and batteries. Africa has become a dumping ground for electronic waste for the Western world, with sometimes even well meaning people and companies sending discarded computers to developing countries in the misguided belief that they are helping the disadvantaged, only for the items to end up in landfill. “Heavy metals, including cadmium, lead and beryllium leech into the ground at landfill sites,” says the chairperson of the e-waste Association of South Africa, Keith Anderson. “Most of these sites are situated close to rivers and the contaminants eventually end up in the water.” The non-profit organization is currently working on a plan to try to set guidelines for the electronic waste industry in South Africa.